The world knows Sri Sai's Eleven hope-giving eternal assurances. These are comparable with assurances in holy scriptures such as the Bible and Bhagawad Gita. We shall look at the significance and relevance today of all eleven assurances of Sri Sai Baba - Who was a truly unique manifestation of God and a messiah as Jesus Christ. 2. The wretched and miserable would rise into plenty of joy and happiness as soon as they climb the steps of my mosque. 4. My tomb shall bless and speak to needs of my devotees. 7. I am ever living to help and guide all who come to me, who surrender to me, and who seek refuge in Me. Assurances 1. and 2. serve the purpose of recreating a safe haven of peace first in the hearts of the suffering devotees and transferring their awareness to Shirdi and Dwarakamai mosque and helping relax their stressed nerves to help heal and focus their troubled minds on the holy target destination of Shirdi - where Sai Baba, the 'God who Descended on Earth' is waiting to solve sincere devotees' troubles. Assurances 3., 4., 5. and 6. These 4 assurances draw the suffering devotee to picturize Sri Sai's holy tomb and living physical remains from where ever these devotees are. These assurances instill a spark of hope inside devotees that death of Sai's physical life cannot put a full stop to His work. These assurances serve to remind devotees that Sai Baba was not merely the three and half cubits of flesh and blood. His powers were extraordinary and will remain all-powerful even after His physical form has vanished just as Jesus got transformed into Spirit presence after resurrection to continue His duty of redemption of humankind from Sin to the Kingdom of God. Assurance 7. By this, Sai assures all that He is accessible to all even now, and that however times have changed His mission to save devotees runs forever - and that He still is the inner ruler residing in our hearts - by which reason He will respond to sincere prayers residing in our hearts itself. But we will need to truly believe that as Lord Hanumanji demonstrated to all that Sri Seetha and Sri Ram were indeed in His heart. Assurance 8. By this, Sri Sai Baba removes dualism attitude inside devotees that Sai is different from them and exists separately outside. By this, Sai is achieving an awakening within the devotee that Sai is both inside and outside and everywhere. This awakening is triggered within our hearts whenever we look at His eyes straight with deep faith. 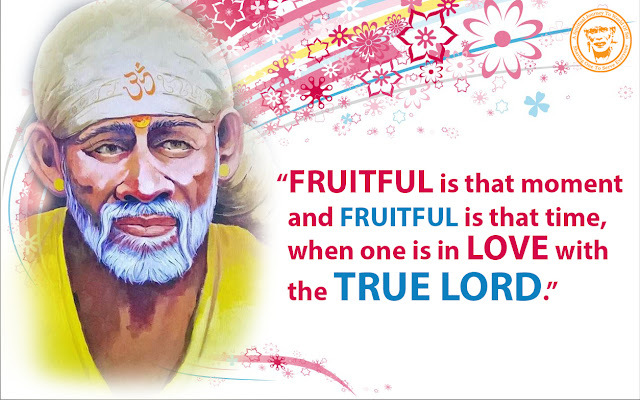 Thus this assurance helps to "Remove the wall ('Teli') that separates us from each other" as Sai Himself said. Assurance 9. This is similar to the assurance by Jesus Christ from the Holy Bible and many a weary troubled person with heavy heart have found respite and a feeling of removal of pain from carrying heavy troubles mentally by this assurance. It also assures devotees of Sai's infinite powers 'Omnipotence'. Assurance 10. This assurance shows us Sai's Omnipresence and quickness in answering prayers. Assurance 11. Sai's Annapurna Siddhi of food multiplying many times has been witnessed hundreds of times by devotees during Sai's time then and even now during recent years. Sai devotees get basic needs of food and dress somehow by Sai's grace. Even in the exceptional cases where needs are not met, Sai worship gives them a feeling of satisfaction and contentment with whatever they received. - By Bharath Kumar K.
If Sai Baba is really omnipotent then why can't He change a person's rude behavior? I worship Him day and night. Did every vrat. Yet. No positive responses from anywhere. Family life is troubled. No job. No love. No money. Nothing. My heart is still heavy. I cried. I'm in pain. I wish Baba is omnipresent and omniscient in my life too. :'( i love you Sai Baba. Worship Devi in a form you like. Sai tells me at times to surrender to Shiva. Goto yoursaibaba.com to get questions answered. Try contacting c.b.sathpathy guruji through whom Sri Sai acts. Shri Sarva Samartha Sadguru Sainath Maharaj ki Jaya . Share the daily workload of your parents or spouse and others at home. Working hard even on small household items does wonders for the body, mind and spirit. Hard Work is important as it builds self-respect and releases positive energy. Work smart but please do not ignore working hard also. Understand your attachment to money during this period - e.g., how much you personally need, how much your family needs, etc. Think about ways money was being spent before during employed periods. Isolate your real Needs from the Luxuries. Arrive at a balance that suits both the individual's specific personality and family situation. Try seeking a Guru (Teacher / Guide) for directing your life - such as Sri Shirdi Sai Baba, Sri Sathya Sai Baba, Sri Ramakrishna, Swami Vivekananda, Kanchi Sri Shankaracharya (Paramacharya) - to name a few. Obtain books, read about the Guru's Biography, life struggles, teachings, advice to the world, etc. Resolve to re-engineer your life towards these great personalities. Also get help and guidance from responsible friends and like-minded people to give you relevant details about your chosen field of work. Devote a bit of time daily to read worth-while life histories regularly. Read (even a little helps!) life stories of great peoples' struggles as well as books on self-improvement, developing will-power, self-confidence, communication, and positive thinking. This removes inner stress and brings out an awareness on great people had struggles too. This will help lead you to solutions to your personal problems. Learn to discriminate between constructive criticism and mere bitter comments. Try to learn from the constructive comments. Practice breathing techniques to protect your self-respect from undue criticisms. Repeat within yourself constantly that You Are Really Worth More Than What You Are Now. Sairam. Happy Shri Ganesh Chaturthi Wishes to you and family! Yesterday condition of Sri Sai devotee reader of this blog to my latest article reminded me of an article wrote by myself five six years back. (hope it helps to guide Sri Sai Devotees facing life without money or a paid job).. Thank you. Sai. Use this time to know yourself - your likes, dislikes, childhood dreams, discover special talents hidden in you so far such as writing, poetry, crafts, arts, etc. Nurture these A Little Bit - daily or few hours each week WHILE PURSUING YOUR JOB SEARCH. Who knows - this hobby or talent can become a second job perhaps later. It is also a Stress- Reliever activity - as unemployment has lots of social disgrace attached to it in Indian society. Remember NOT TO go fully into the hobby activities - as your family's needs of a job must be kept in your VISION ALWAYS. Spend some time in Nature. It will do wonders to your health and self-confidence. Nature is a great teacher, provided we watch these natural wonders closely. Simply walking in a nearby park will do the job of giving clarity to your thinking. Practise 'Reduce-Reuse-Recycle' policy in your life. Use the available extra time now to get better organized. Dispose belongings that you no longer use or need, and free up time for the Really Important things in life. Collect only items that can help your future and which Do Not Harm others or Mother Nature. Undoubtedly you may face rejections and closed doors in your search. Take these in the spirit that A Better job opportunity is waiting for you soon - somewhere else. Remember slogan or a 'Mantra' in your mind that deals with perseverance and determination. These qualities will yield results eventually. Health is the TRUE Wealth! Correct long-standing health problems, weight/dieting issues, sleeping hours changes, during the current period by self-analysis. Get out of any unhealthy habits developed, due to friends, social compulsions etc. Develop a feeling of contentment towards present situation in life - despite unemployed situation. Thank God, your parents, ancestors, and all others for all favors, gifts, blessings and all that you EVER received from others during this birth. With this attitude, work towards securing a better job or profession in alignment with your dreams. to make society better in some form - for e.g., collect and donate used clothes to a good orphanage or charity, increasing local awareness on reducing harmful plastic bags usage, etc. Pray constantly to your favorite God or chosen Guru. This surrender to a higher force and demonstration of service mentality will help you out of your current situation. Bless whole whole universe.Om sai ram.